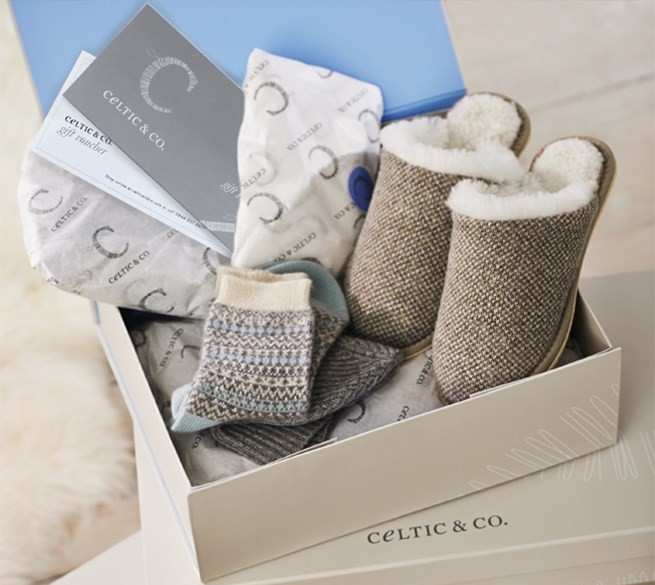 Sheepskin Slippers Gift Guide | Blog | Celtic & Co. Whether you live in the city or the country, everyone needs a cosy pair of slippers when the cold weather begins to roll in. At Celtic & Co. our British-made sheepskin slippers make the perfect gift for all members of the family; whether you are looking to buy for your partner, mother, father, grandparents or younger family members. 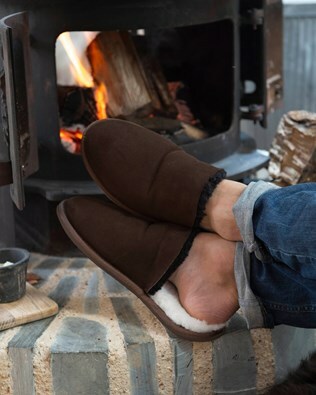 Keep your feet snug this winter with our inspirational sheepskin slipper gift guide. Sheepskin is a sustainable material known for its temperature-regulating properties, so you can rest assured that your feet will be kept warm in winter and cool when the temperature rises. One of our best sellers; our ladies bootee slippers are crafted from ultra-soft sheepskin and feature a light yet durable sole that are perfect for wearing both inside and outside. Handmade in Cornwall, these beautiful slippers will keep your feet cocooned in warmth. For ultimate warmth, these Cornish-made shortie slippers combine lambswool and soft sheepskin to create a super soft slipper. With an effortless slip-on style, the knitted shortie features a durable and lightweight sole perfect for wearing when you venture outside to enjoy your morning coffee in the fresh air. 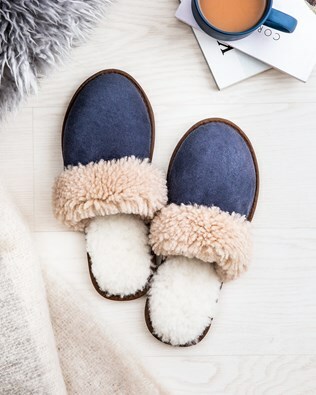 Cosy up by the fire with these classic sheepskin slipper mules. 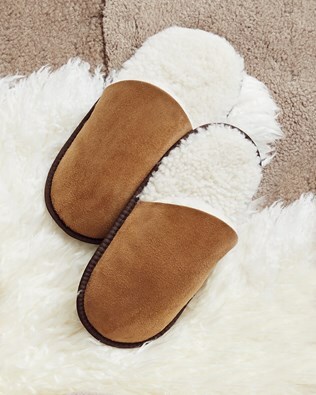 Made from 100% British sheepskin, these easy on-off slippers feature a versatile indoor/outdoor sole, which is ideal if you need to pop outside to let the dogs out or just want to enjoy the fresh winter air. Looking for slippers that travel well? Our sheepskin scuffs are the perfect Christmas gift if you’re off to enjoy the festive season in a country cottage or out on the slopes. 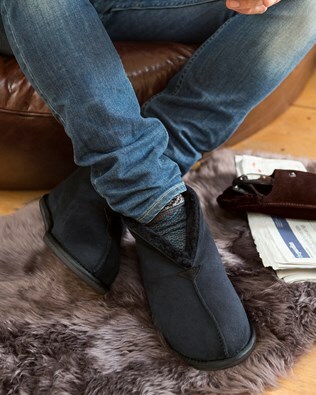 These lightweight sheepskin slippers slip-on easily and can be rolled to fit into a suitcase. Give the gift of warm feet this Christmas with these luxurious Toscana-trimmed sheepskin slippers. Made in Great Britain from 100% sheepskin, these stylish booties are the perfect present this Christmas. Crafted from soft and durable sheepskin, these beautifully designed slippers make the perfect gift for your loved one and can even be personalised to create a functional keepsake for him. 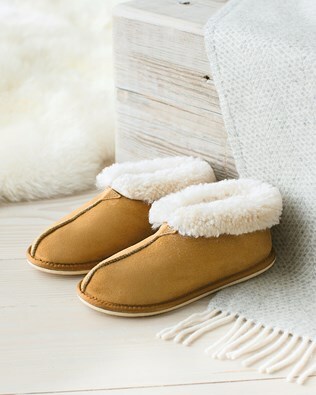 Warm and luxurious, these sheepskin slippers give tired feet a welcome rest. British bred and Cornish made, our 100% sheepskin mules will make the perfect gift this Christmas. Ideal for relaxing at the end of the day, these cosy slip-on slippers have a hard sole that can be used both indoors and outdoors. Keep little feet toasty with our kids’ sheepskin bootee. The perfect Christmas present for boys and girls alike, snuggle up with these comfortable yet durable children’s slippers. The hardwearing soles can be worn both indoors and outdoors and the bootees are machine washable for ease. Looking for the perfect gift for baby’s first Christmas? Then shop our 100% sheepskin pram shoes. Designed to keep little toes warm and snug, these cute little pram shoes will make a luxurious and practical gift for the newest member of your family. Sheepskin has temperature regulating properties that will ensure that your baby is kept warm in winter and cool in summer. For little ones that are on the move, our adorable 100% sheepskin crawler shoes are designed to be extra soft, so your little one can explore their environment with ease. Our sheepskin baby bootees are machine washable and feature a velcro strap to stop them slipping off. Ideal for the littlest member of your family this Christmas. To make your gift extra special, let us add the finishing touches to your present by gift boxing your Christmas present and delivering it directly to your loved one’s doorstep. By selecting the Gift Box option in your shopping basket, we will lovingly wrap your Christmas presents in tissue paper and place it in a Celtic & Co. gift box, with the option to include a personalised Christmas wish inside.